Power Cord Length: 4.6' Ft.
Keep the drinks chilled with the NutriChef Electronic Ice Maker. Simply plug it in and add water for instant ice-making ability. Hassle-free operation allows you to press a button and create pellet-shaped ice quickly. The stainless steel housing features a window to see the ice level capacity within the unit. The high-powered freezing element makes up to 22 pounds of ice in a day, ensuring all of your guests will enjoy crisp, chilled drinks. Perfect for any kitchen table or countertop. 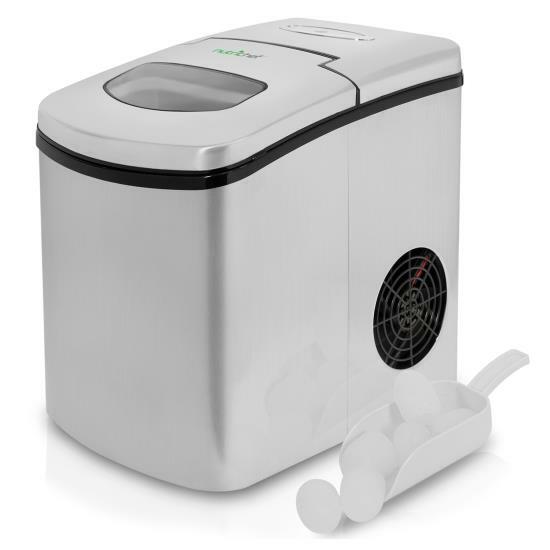 Add convenient kitchen style with the NutriChef Ice Maker. Review : It is a fantastic addition to our RV. Very quiet and fast. Easy to set up.